Every now and again, it’s good to stretch your creative muscles. That’s why a couple of my girlfriends and I take turns hosting a craft day at our respective houses. This weekend, I had the privilege of hosting Katie and Stephanie. Past projects included spray paint art using leaves as natural stencils at Stephanie’s house and putting together table numbers for Katie’s wedding back in May. This go-round, we decided to try our hands at a little 3-D art thanks to some inspiration from the Etsy Shop, Handy Maiden. I was already in love with Danielle’s (the shop owner) work before embarking on this project, but now after having tried to sculpt little animals myself , I have an even greater respect for her talent, but I’m getting ahead of myself. To kick things off, I headed to JoAnn Fabric to see about finding some polymer clay, because this type of clay can be “fired” using a home oven. Pretty neat, huh? It’s also available in a variety of colors, although for this project, we’d already decide to hand paint our figures once they’d been fired. When the girls came over on Sunday afternoon, I had already laid out the materials we’d need to get started. You know, the important stuff like warm brie, homemade bruschetta, and a bottle of Cupcake Vineyard’s Prosecco. Seriously though, if you think you’d like to try something like this at home, make sure to check out the materials list below to get what you need. I watched a couple of YouTube tutorials on the making of polymer clay charms, that were actually pretty helpful before kicking things off in real life. It’s actually pretty simple to get started – you break open the clay, roll it around a bit in your hands to make it more malleable, and then begin creating shapes. 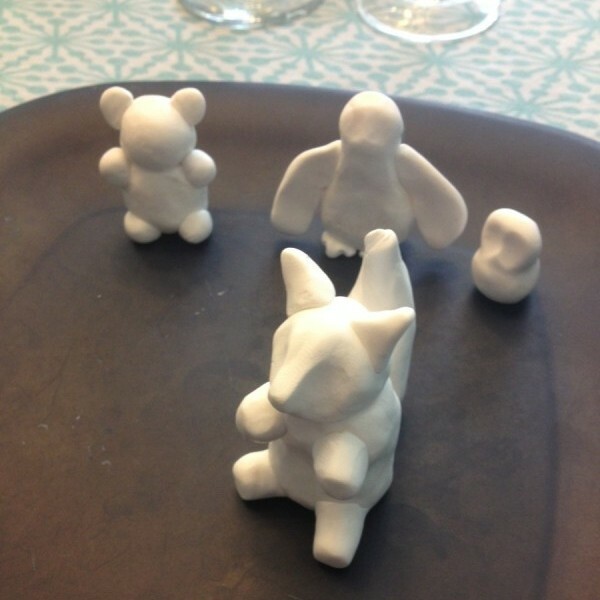 Once we were happy with the shape of our animals (see image above), we preheated the oven to 230˚F, put some wax paper down on my oven stone so that the figures wouldn’t stick, and baked them for thirty minutes. To help pass the time while we waited for our animals to bake and cool, our secondary project was to watercolor, another something I’ve never done before (well, as long as you don’t count elementary art classes). Katie (our resident watercoloring guru) suggested we each find a photo to use as reference for the sketching portion of the piece. 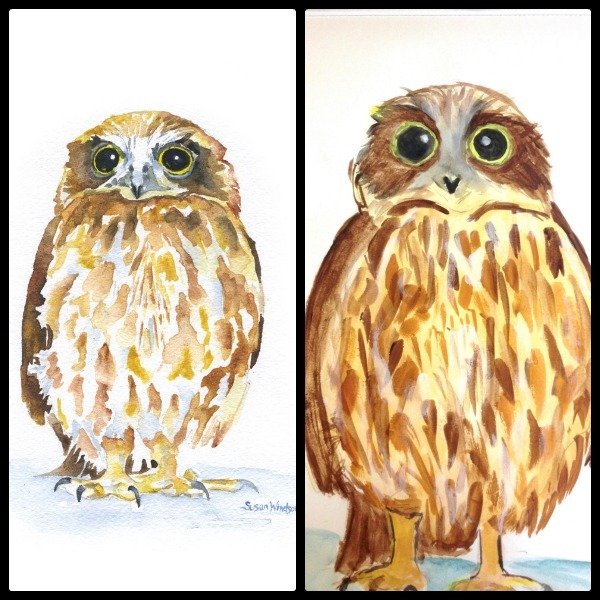 I hadn’t really given much thought to this portion of our craft day, so I did a random Google search for “owl watercolor.” You can check out the piece that I decided to use as a reference in the image below on the left. While I’m actually pretty happy with the results of my first experiment with watercolor, I can definitely understand why Katie spent so much time on her sketch. Can you guess which part of the image I spent the most time sketching? (If you said the head/face, you’re correct!) In the past, I’ve always been too afraid of failing miserably to try my hand at painting, but today’s exercise gave me the confidence I needed to give it a shot. 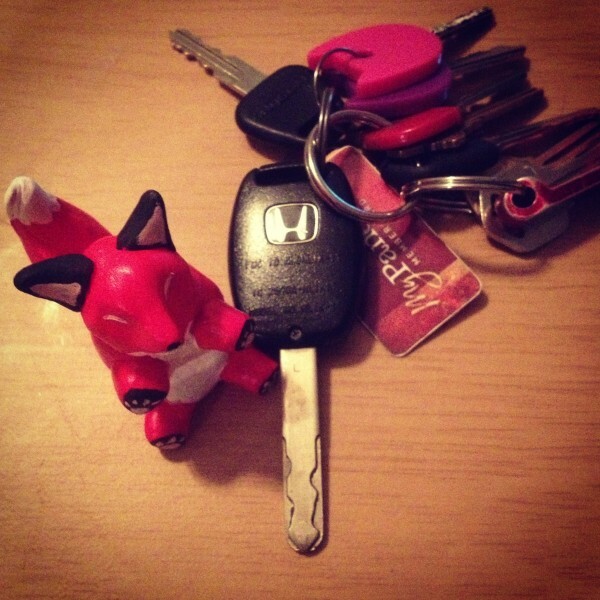 Don’t be surprised if you start to see more of my attempts on the blog in the near future. So after about an hour or so of watercoloring, our little animal figures were ready to paint, which ended up being a task that was much harder than it sounds. However, with a little patience, multiple coats of paint in a plethora of colors and a glass or two of Prosecco, the totems came to life! 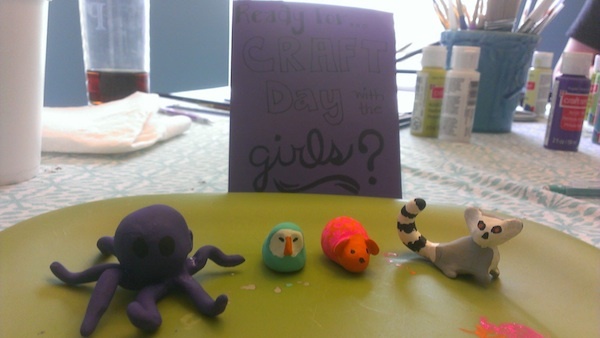 Pretty sure my favorite animals of the day was Steph’s lemur and octopus. Aren’t they cute?! 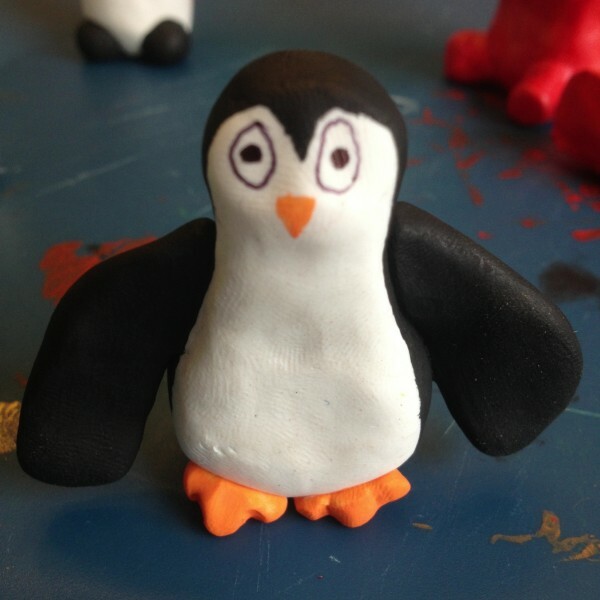 I was also pretty stoked about how well my penguin turned out. What creative things did you tackle this weekend? They need sticky tack on their heinys so they can sit on computers! The octopus rocks socks!